Learn more about this National Historic Landmark. Several times a year, AD EX leads an hour-long walk through the most historic portion of Fair Park. The signature Hall of State and its approach from the main gates and down the Esplanade transformed the fairgrounds into a venue worth of the 1936 Texas Centennial Exposition, our very own World’s Fair. Along the way, we’ll discuss how Centennial Architect George Dahl took existing buildings and transformed them into Art Deco showplaces, utilizing an international roster or architects and artisans to accomplish the feat. Current tours are set for April 17, May 15, and June 19. The tour begins at noon at the main gates at Parry Avenue and lasts approximately one hour. The tour is free, but registration is required. RSVP to info@DallasADEX.org with Fair Park in the subject line. EXPERIENCE ART DECO AT ITS BEST. 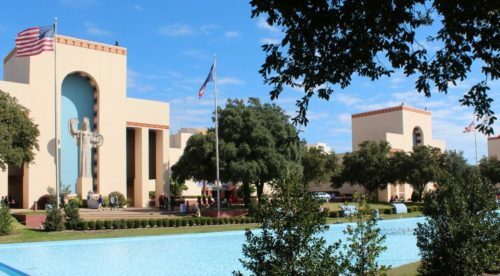 Visit our calendar page to see the schedule for all of our Fair Park walking tours.